anyway, looking forward to hearing the 21 inch Mini. 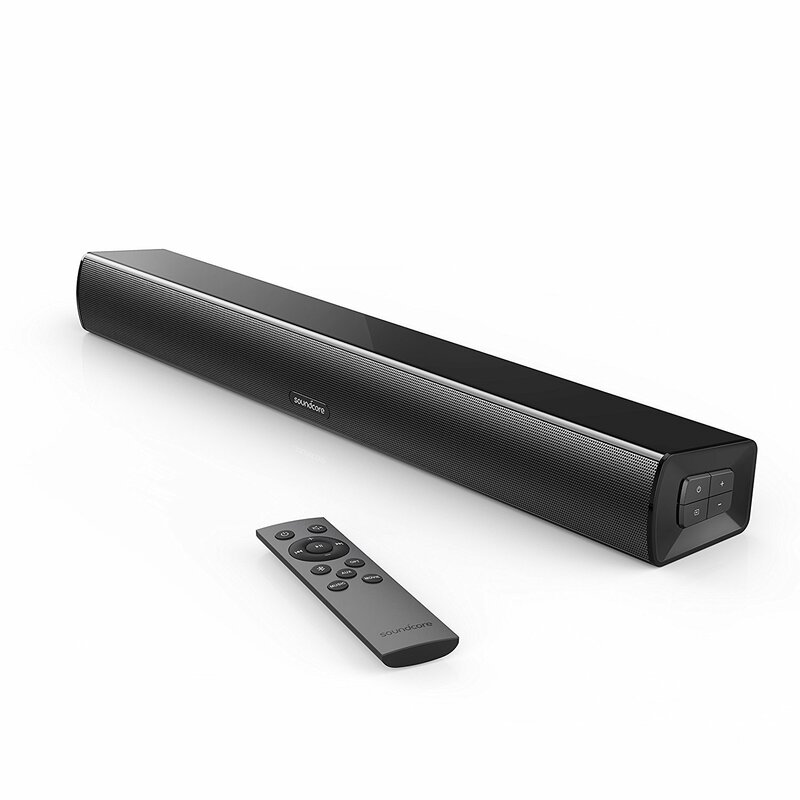 So is it just a bt spkr, or is it a proper soundbar.... Multiple inputs? Aux, jack, optical? 40w, would be plenty in our situation... Inline in a 1950s built apartment mini block (total 6 apartments/flats), and sounds travel. There are enough times of me banging on the ceiling/floor due to rude noisy neighbours, and I'm half deaf! Anker Space NC x2 and the Anker Soundsync? Cancel out your neighbours' noise and watch TV together? Soundcore Infini Mini is now available on Amazon, though it is not yet appearing on the Soundcore website. IMPORTANT: The information and pictures are NOT fully updated, so I was hesitant to share this link, but you can already order the product, and it is set to begin shipping right away, so hopefully the listing will be all up-to-date very soon. Note: Although the price is currently listed at $99.99, we expect this to drop to $79.99 shortly. When the regular Infini launches in a couple months, it is expected to be priced at $99.99. I do not see dimensions, on Amazon I see: Package Dimensions	2.7 x 0.6 x 0.4 inches ?? nothing I can see in the manual. 5w that's as useful as a used teabag... It'll stain the water but won't be tea! If you're gonna sell something @AnkerOfficial, at least get the description correct. You're not telling me, that this speaker, is just 5w. This description, needs more than just the title improving. Wow thats great! I need two of these! As @elmo41683 mentioned, more pictures are now available on the listing. Now, we’re just waiting the price to drop down to $79.99 and the description to be fixed with the appropriate information. I said, the description doesn't match the pictures and was one of first to say the description itself was wrong. Please refer to my original post. Soundcore Infini Mini: Space-Saving Cinema Sound. Amplify Your Audio: Infini Mini's dual full-range drivers and bass port enhance your TV's audio to fill cozy bedrooms and compact spaces with huge cinema sound. Flexible Placement: Infini Mini's low profile and compact, 21-inch length ensure it can be placed almost anywhere. Position it discreetly in front of your TV or computer screen, or attach it to the wall using the provided mounts. Tailor Your Sound: Infini Mini's sound modes use a digital signal processor to automatically adjust and optimize sound output. Movie mode strengthens the bass and treble for a more cinematic experience, while music mode offers clear, well-balanced highs, lows, and mids. Multiple Input Options: Use the optical or RCA to 3.5 mm stereo audio cables to connect Infini Mini to your TV to enjoy your favorite shows, movies, and video games. Alternatively, use Bluetooth to wirelessly stream music, podcasts, and more from your mobile device. Dual Controls: Use the remote to switch between input modes, adjust the volume, select a sound mode and more. For even greater versatility, Infini Mini's built-in buttons also give you direct access to its features. I am happy to report that the listing has finally been fully updated. Title, images, description, specs, etc. There are just 12 left in stock now, so you’d better hurry!